The latest Best Buy Labour Day Sales flyer is here and you can see it now on WeeklyFlyersCanada.com! You have 4 days to shop this new eight-page flyer, which includes limited-time 1/2 price deals, Android Smartphones, Laptop, Bluetooth Headphonesand more!. 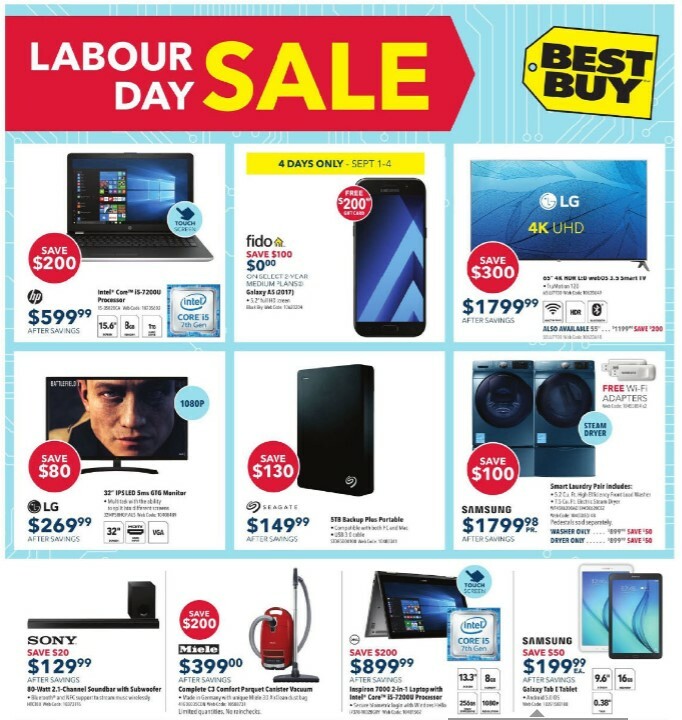 Look a peek below to see some of the Best Buy Labour Day Sales offers available in this weekly flyer. HP 15.6" Touchscreen Laptop Model #: 15-BS028CA - Sale Price $599.99 Save $200.00 The HP 15-BS028CA 15.6" touchscreen laptop delivers the reliable performance you for work and play. A 2.5GHz Intel Core i5 processor, 8GB of RAM, and a 1TB hard drive ensure you can stay productive. The 15.6" LED touchscreen display is bright, clear, and vivid, so on-screen content looks sharp and detailed. It has Gigabit Ethernet and built-in Wi-Fi. LG 32" 60Hz 5ms IPS LED Monitor Model #: 32MP58HQ-P.AUS $269.99 - Price $80.00 Savings Whether your priority is productivity or entertainment, the LG 32MP58HQ 32" IPS LED monitor has everything you're looking for. Sporting a superb 1920 x 1080 Full HD resolution, this monitor is loaded with features that will take your entertainment to the next level. The Screen Split options let you multitask like a boss. Seagate STX Backup Plus 5TB 2.5" USB 3.0 Portable External Hard Drive Model #: STDR5000100 $149.99 - Price $130.00 Savings Enjoy peace of mind knowing your digital life is securely backed up on this Seagate STX Backup Plus portable external hard drive. Sporting a spacious 5TB capacity, it backs up your data without worrying about electronic hacking or slow cloud storage upload speeds. It features lightning-quick USB 3.0 connectivity and easy-to-use backup software. Samsung 5.2 Cu. Ft. HE Front Load Washer & 7.5 Cu. Ft. Electric Steam Dryer w/ Free Wifi Adapters Model #: B0007086 $1799.98 - Price $100.00 Savings Make short work of your laundry with this Samsung washer and dryer bundle. It features a 4.5 cu. ft. front load washer with Vibration Reduction technology for quiet operation. It also comes with a 7.5 cu. ft. electric steam dryer with 12 cycles and 5 temperature settings, as well as a built-in moisture setting to prevent overdrying. ***Please Note: Pedestal sold separately. Sony HTCT80 80-Watt 2.1-Channel Sound Bar with Wired Subwoofer Model #: HTCT80 $129.99 - Price $20.00 Savings Don't settle for small sound, enjoy clear and powerful audio from your movies, TV shows, and more with the Sony HTCT80 2.1 channel soundbar with wired subwoofer. Delivering 80W, it features digital optical and analog inputs, and supports Bluetooth and NFC streaming. Miele Complete C3 Comfort Parquet Vacuum Model #: 41GDE035CDN $399.00 - Price $200.00 Savings Tackle dirt and debris on floors and carpets with the The Miele Complete C3 Comfort Parquet canister vacuum. Designed with a 1200W motor, 6-step foot-activated suction, and AirClean System, this vacuum effectively picks up dust, dirt, and debris while filtering and refreshing the air. The Miele 3D AirClean dustbag traps even the finest dust particles. Samsung Galaxy Tab E 9.6" 16GB Android 5.0 Lollipop Tablet Model #: SM-T560NZKUXAC $199.99 - Price $50.00 Savings There's something for everyone with the Samsung Galaxy Tab E tablet. Designed with the whole family in mind, it sports a 16GB internal memory capacity, speedy quad-core processor with 1.5GB RAM, the intuitive Android 5.0 Lollipop OS, as well as convenient multi-user and multi-tasking abilities that make this tablet a breeze and a pleasure to use. Shop for Gaming Gear, Desktops, Monitors, Tablets, Computer Accessories, iPhone 6s and more amazing apple products and price can be viewable on Best Buy Flyer this week.